Studio 5380: Peachy Challenge #31 AND a Winner! Hello everyone and welcome to my little Craft Corner! Congrats to you Chriss! Please use the "Contact Corner" tab at the top of my blog to leave me your mailing address. I'll get your gift out to you soon! 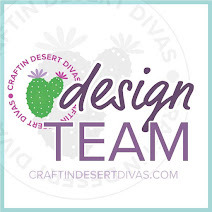 Be sure to check Candace's blog at Scrappin' 2 Little Princesses for the winners of the awesome prizes supplied by the fabulous sponsors of our blog hop! 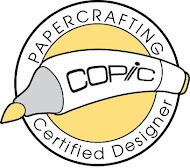 * After cutting out and assembling the box, I covered the lid with cute paper from the "Spooksville" paper stack by "The Paper Studio". The edges were created with a Martha Stewart punch. * I lined the inside of the box and the 2 ends with more fun printed paper. * I used the Peachy Keen stamp set "Monster Face Assortment" for that sweet little face! * Martha Stewart glitter adds a bit of bling to my monster's hairdo! * A few doodles with my white gel pen and some cute purple twine are the finishing touches. 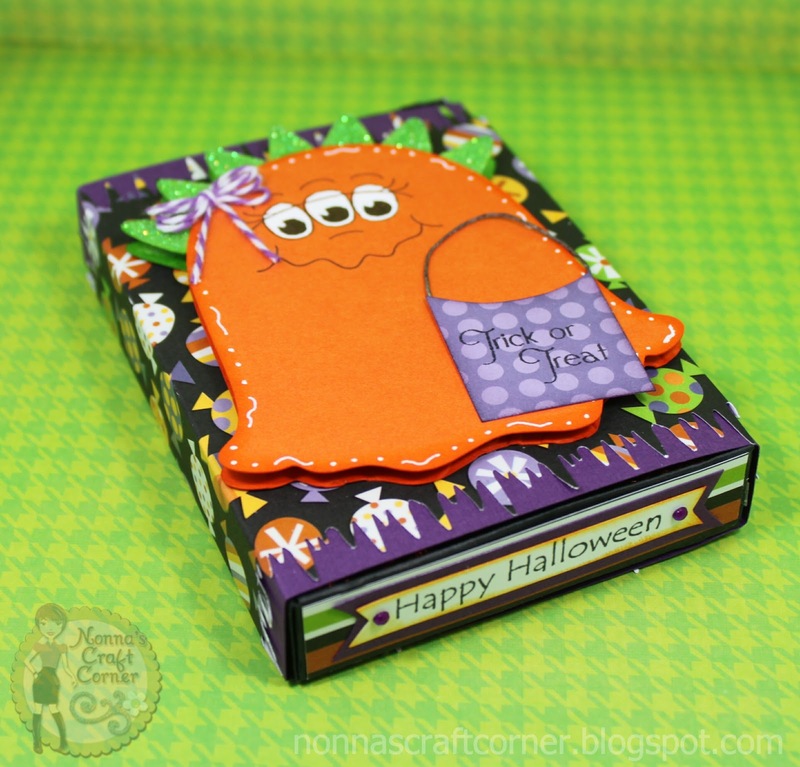 * "Happy Halloween" is from the Pink By Design stamp set "A Haunting We Will Go". And, there you go, a cute little Halloween gift for one of my little monsters! Thanks so much for stopping by today. I hope you've enjoyed my "Box It Up" project. Please drop by again soon - I love your visits and your sweet comments just make my day! Take care and I'll be seeing you soon. 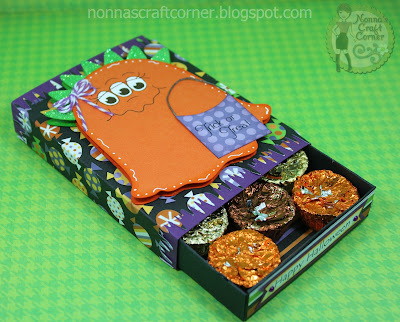 This is such an adorable treat box, the little monster is so cute with the three eyeballs! Great colors too! This is ADORABLE! Love that little monster! This is just adorable! I got this cart not even knowing why....but after Art Philosophy, I figured it was a "must have." Now...I see why...keep em coming, my talented friend! This has got to be the cutest halloween gift box EVER!! Love the adorable monster and great colors! is this box deep enough to put peanut butter cups in? that's what it looks like you have. i'd like to make this. thanks. Super Duper Cute! !I love it! !Too Cute! Oh my gosh, this is so awesome!! The monster is scarily cute and I love the box!! What a fabulous project!! I hope you have a great week :) And congrats, Chriss!! This is just too stinkin' cute! I have the cartridge too ...and can't wait to try something like this! Hope you don't mind if I kind of "lift" it! Oh my goodness, Tanya, this is just so adorable. I've wanted to make that very box. Your selection of papers and the doodling add so much to this delightful card. What a sweet box! Love the bow on the monster and the glitter is the perfect touch! Too cute! this is soooo adorable !!! love the candy and the that face is perfect !!! Thanks so much for joining us at Peachy Keen this week !! Tonya ~ OMG! What a CUTE and FABULOUS box! I LOVE that little monster and that box ~ LOVE it! The details are amazing and now I wish I would have bought that cartridge!!!! ADORBS! I am in love with this adorable treat box. I am patiently waiting for my cartridge and can't wait to use it!! I love how you decorated the box:) So fun!!! This is so stinkin' cute! What an adorable little critter! Absolutely precious! Love it! Oh, that is so adorable, Tanya!!! :) I love your cute treat box!